Why should my son wrestle? Physically, wrestling provides an incredible full-body workout. The boys get incredible conditioning while developing strength, balance, speed, and flexibility. Boys who come from other sports are always impressed at the workouts in a typical wrestling practice, and parents are often pleased at their kids' newfound interest in healthy eating! Emotionally, wrestling develops a level of self-confidence that goes beyond any other sport our kids compete in. Every year, we have some boys who join the club who are timid, quiet, even nervous. 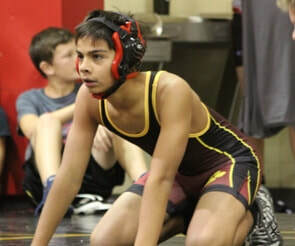 With so many supportive coaches in the practice room, those boys begin to understand the wrestling instruction and start to have success with wrestling that makes them feel good about themselves and excited to compete. The most satisfying thing for me to see is how those boys grow over the years. We remember how timid they were when they first joined the club, and see them turn into confident young men who have the courage to step onto a mat and go toe-to-toe with an opponent. And the beauty of wrestling is that anyone can do it. It is a sport that can accommodate every body style. You don't have to be tall, you don't have to be thin, you don't even have to be a "natural" athlete. There is a place for everyone in wrestling. Accountability. For a wrestler on the mat, it's just him. He is alone out there with all the tricks from practice, his coach's moves, his own self-talk and plans to have his hand held in the air at the end. He can blame no one. This is something he does alone. It's true in wrestling, it's true in life. Every takedown is yours, every escape, every pin, every mistake. This sports teaches humility as well as pride. There is no hiding. From the stands, every single young man looks brave. On the mat, every single wrestler owns his actions. More people should believe in that simple truth. Socially, there is nothing like the wrestling community. We are a tight-knit family. The high school wrestlers take an interest in the younger wrestlers, and our club wrestlers come out to support the older boys as much as they can. The families get to know each other well, especially those of us who spend nearly every Sunday together for three months! The boys in the wrestling room are like a band of brothers, supporting and encouraging each other to bring out the best performances on the mat. While at the club level, the main competition is individual, our wrestlers share a bond unlike any that you see in any other sport. 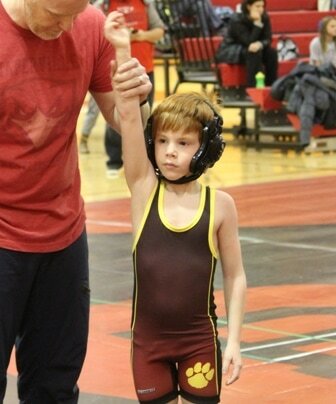 And this sport is populated by many, many wonderful kids and parents who share an appreciation for wrestling. Because the club works so closely with the Rotolo Middle School and Batavia High School coaches, we really do become like one large, extended family! 1. Agility – change position easily and efficiently. 2. Quickness – complete a series of movements in a short time. 3. Balance – maintain equilibrium through muscle control. 4. Flexibility – make a wide range of muscular movements. 5. Coordination – combine movements with flowing rhythm. 6. Endurance – build stamina. 7. Power – use speed and strength simultaneously. 8. Aggressiveness – keep the pressure on the opponent at all times. 9. Discipline – make sacrifices to improve yourself as an athlete and a person. 10. Attitude – take pride in knowing you gave it your all, win or lose. "In wrestling, you've got to have self-discipline and self-motivation. As a lineman, it's the same thing ... me vs. you. [Tim Lee, Texas High School All-American] brings that mentality to the football field."